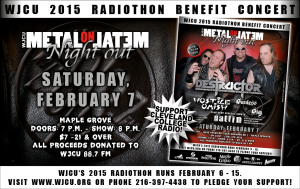 Join us for the WJCU 2015 Radiothon Benefit Concert on Saturday February 7, 2015 featuring Destructor, Hostile Omish, Sunless Sky and very special guests Gatlin. Please come out and support WJCU during this year’s Radiothon. For more information on Radiothon visit the wjcu.org homepage.